One of nature’s great events is the annual wildebeest migration that takes place in Africa. Millions of the large mammals move from one feeding area to another in massive herds. 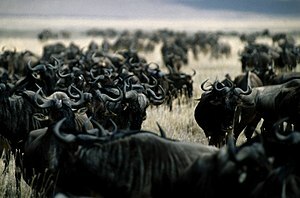 The herds work well for the wildebeest as travelling in such large numbers protects them from predators, mainly lions. If they were by themselves, they would be easy pickings, but there is protection in the herd and they all know it. Unfortunately, most people think that the benefits of the herd apply to humans as well. Whilst we are undoubtedly meant to be in community with others, the herd can hold us back. The herd resists change, creativity and an entrepreneurial spirit. The herd allows you to hide away and not reach your full potential. The herd encourages yes-men and unthinking consensus. The herd is cynical and pessimistic. The herd knows its rights, but forgets its responsibilities. The herd is slow to respond and takes a long time to change direction. The herd is suspicious of anyone who is different in speech, appearance or beliefs. The herd philosophises and complains, but leaves the action to others. Herds are a great idea for wildebeest, because they increase the chances of survival. Do you want to survive or live? I would encourage everyone to make sure that they have a group of people around them who inspire and challenge them to greater things. Just don’t join a herd!